Needham, Mass., October 16, 2017 – Bigbelly, Inc., the world leading Smart City Solutions Provider specializing in smart waste and recycling systems, today announced that it was awarded a contract with the Illinois Public Higher Education Cooperative (IPHEC) – the contracting vehicle for all 13 Illinois state universities – valued at $5.7 million. Under the contract, Bigbelly will provide access up to 500 Bigbelly smart waste and recycling across any and all of the universities. The University of Illinois at Chicago (UIC) is the first cooperative member to take advantage of the contract. 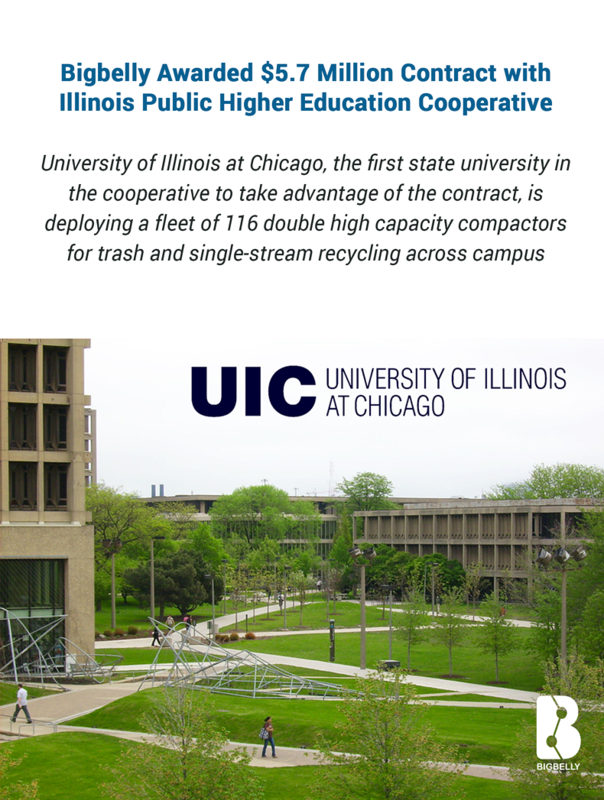 UIC is expanding an existing base of sixteen high capacity compactors for waste and single-stream recycling in eight locations on campus with an additional 100 components. Fifty spots in the high pedestrian traffic areas of the East and South ends of campus will house the new Bigbelly units. A customer since 2015, UIC has realized significant metrics of success and benefits from their initial Bigbelly deployment. Since installing the double units, over the past 12 months the University has maintained an impressive recycling diversion rate of 52 percent and reduced waste and recycling collections by 85 percent. Monthly collections have dropped from 28 to 1.5 collection per bin. The Facilities Management Grounds Department now completes collections in just one weekly cycle versus the average seven times per week schedule maintained before the Bigbelly deployment. Operating at 87 percent average efficiency for the last 12 months, the University’s waste management efforts showcase the enormous capacity and real-time collection notification of the Bigbelly system. Expanding the Bigbelly fleet supports the University’s commitment to introducing campus-wide recycling and ongoing efforts to provide an aesthetically pleasing and consistence campus appearance. The high-tech, high efficiency units will replace 189 open top existing waste bins for improved total waste containment and pest mitigation on this urban campus on the skirts of Chicago. Overall bin foot print will reduce by 73 percent even with increased capacity and the addition of a recycling waste stream. Finally, UIC is pleased with the productivity gains afforded by the Bigbelly system. The crews that collect waste also handle snow removal across campus. Bigbelly enables the University to reallocate labor hours during winter storms to snow removal operations from unnecessary collections. Bigbelly, Inc. is a prominent Smart City solution provider as the world leader of smart waste and recycling solutions. Deployed across communities, campuses and organizations in over 50 countries, the cloud-connected Bigbelly smart waste & recycling system combines smart, sensing, compacting stations with real-time software. Customers experience up to 80% collection reduction in addition to cleanliness, operational, economic, and environmental gains with Bigbelly. Discover more at www.bigbelly.com and connect on Twitter (@BigBellySolar), LinkedIn, and Facebook.